Could you live in a lopsided house? We are accustomed to straight lines, parallel sentences, and the value a sense of uniformity. But is this the best way to live, or to write? Some writers recommend using outlines, and have many valid reasons for doing so. I was always the kind of student who wrote my outline after I finished my research paper or essay. How else would I know what I was going to say until I wrote it down? As a writer, I am what is know as a “pantser.” I write by the seat of my pants. I have a vague idea where my story is going, but I don’t know for sure until I start writing it. For me, the most fun part of writing is the surprises, when a character jumps into the story when I didn’t know he was going to be there, or when a character encounters a situation that I did not plan, and the writing just seems to flow. That is exciting. So what would you do with a lopsided house? Straighten it up? Or change your life? 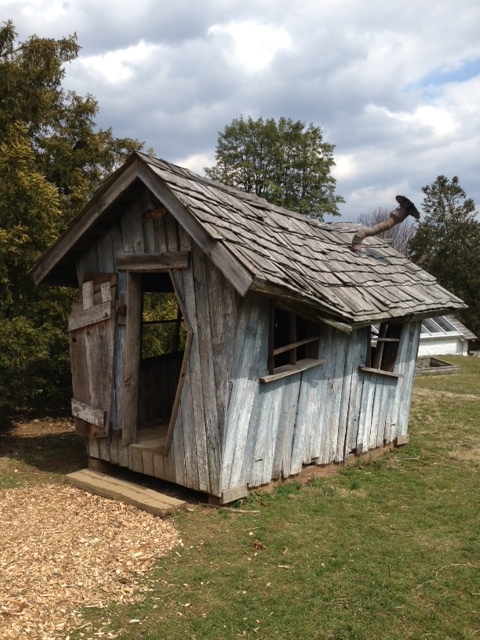 And just so you know, the lopsided house in the photo is a “goblin house” at Tyler Arboretum, outside Philadelphia. It is great fun for the imaginations of children and adults. I play there whenever I have the chance.